Track and trace solution is becoming a necessity for every company for securing the supply chain as well as for maintaining its smooth functioning. Track and trace solution also helps in recalling the products more accurately if such a need arises. In sectors such as pharmaceuticals, implementation of Track & Trace solution has been made mandatory by the government in many countries. Track and Trace solution helps in capturing a product’s status in the supply chain and identifying and verifying its path in the chain. 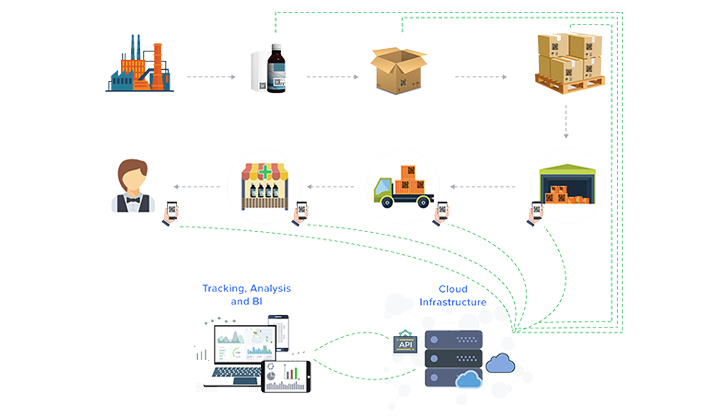 A typical Track and Trace solution has features such as associating each level of product packaging with a unique identifier, capturing events of product/package movement at various points in the supply chain, and performing the search, analytics and reporting on the captured information. Some solutions include ways to share information with regulatory agencies or trading partners, and some also provide capabilities for product authentication. Another advantage is that the company can more efficiently anticipate the right quantity for the next production. A good track and trace solution helps companies in inventory management as well. 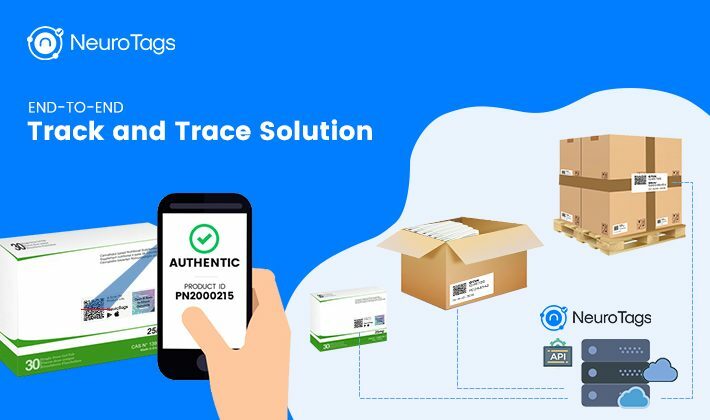 NeuroTags provides end to end, digital Track & Trace solution which is very cost-effective and does not need the client company to invest in special types of equipment for tracking and tracing the products. The solution also does not disturb the company’s current production cycle or the supply chain. NeuroTags Track & Trace solution is easy to deploy and can be customized as per the client’s requirements. Let’s try to understand this at each level of packaging. The packing which is in direct contact with the product is called the primary packaging. 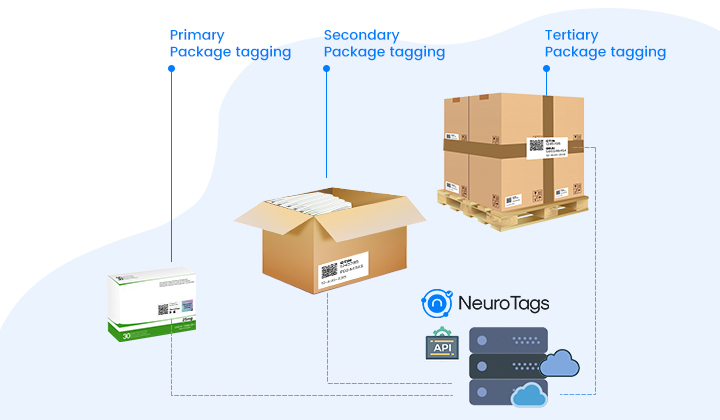 NeuroTags provides algorithmically coupled tags to be applied to the primary packaging of the products. Each of the tags, applied to the primary packages, is unique and comprises of two parts – Open tag and Protected tag. Open tag is used for tracking and securing the supply chain, and for providing product information to the customer. Protected tag is either hidden by a scratch layer or is kept inside the product pack. This tag can be opened and scanned only by the product buyer after making the purchase. The package that is used to group multiple primary packages is called the secondary package. Secondary packaging is labeled with an open tag. Each of these tags is unique. All the primary packages under a secondary packaging are linked with the parent-children relationship. These tags can be scanned at each point of the supply chain once they are out of Tertiary Packaging. They connect each point in the supply chain to previous and next and secure the supply chain. The final packaging, done for safe shipping transportation of the products, is called tertiary packaging. All the secondary packages under a tertiary package too are linked with the parent-children relationship. So the secondary packages become children to its tertiary packaging, and all the primary packages become children to its secondary package. An authorized person can see what all secondary and primary packages are contained within a tertiary package by scanning the tag on the tertiary packaging. Each of the tags can contain additional information, such as expiry date, manufacturing date, etc. as per the client company’s needs. The tags are scanned at each point of the supply chain. They connect each product and node in the supply chain to the previous and next node and secure the supply chain. NeuroTags captures product status information at each scan point in the supply chain. This information is then used to verify the product’s path. NeuroTags provides search, analytics and reporting on the captured information. NeuroTags provides an easy way to share the product status information with the regulatory agencies or the trading partners in the required format. NeuroTags algorithmically coupled tags on the primary packaging help the end consumers to check the product authenticity. By scanning the protected tag, the product owner can verify the product’s genuineness with 100% surety.